Want to grow your business, raise capital and know franchising may be an option but you are unsure what’s really involved? Well, franchising is a great way to grow your business, often allowing you to expand locally, interstate and even internationally. But it can cost thousands, take lots of work and, if you don’t get it right, fail – horribly. Avoid the pitfalls and find out exactly what franchising is about. Franchising is not just about preparing the documentation and recruiting franchisees. First you need to get some crucial things right, including budgets, territories and marketing – and it has to be profitable for everyone in the long term. Fail this profitability test and your new franchised business will not succeed. Get it right and it can grow exponentially. There are Seven Simple Steps to help you franchise your business. Learn about franchising: How does franchising work? Work out your businesses feasibility: Is your business suitable? Does it suit you? Develop you franchise model: Prepare franchise documents and the legal agreements. 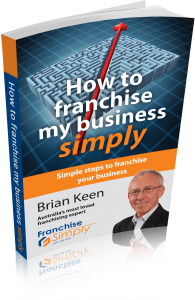 Develop your franchisor business: Get your franchisor business up and running. Establish a franchisee pilot: Operate a franchise outlet successfully. Recruit your first franchisees: Advertise, select carefully, open the first outlet and grow from there. Manage your franchise business into the future: Develop the group as a whole, keeping it current and fresh.